When you ask people about Louisiana they will probably think of New Orleans or eventually marshes and swamps of the Gulf Coast. These associations are obviously correct but there is much more than that in the Pelican State. We entered the state driving across Mississippi River from Natchez to Vidalia on the impressive (if a bit narrow and precarious) cantilever bridge offering great views at how massive the Great River is. As we were driving the heavens opened and torrential downpour started. Basically while we were heading west a huge cold front was heading east. Literally in minutes temperature dropped from about 28C down to less than 15. We decided to wait-out the worst in the state welcome centre where lovely old lady furnished us with all the possible maps and brochures. From the Mississippi valley we drove over 120 miles to Natchitoches crossing the sparsely populated and heavily forested centre of the state. It was raining, the landscape looked anything like the stereotypical Louisiana should look like and it got actually quite cold. As we got closer to the motel where we decided to stay for the night the weather cleared but it got so chilly that we had to put the heating on once we got into our room. Of course it wasn’t freezing, it was still Louisiana, but it was not better than London at the same time of the year. Which was a tad disappointing (to say the least). The following day welcomed us with a clear blue sky and crisp morning air so went to explore the town. 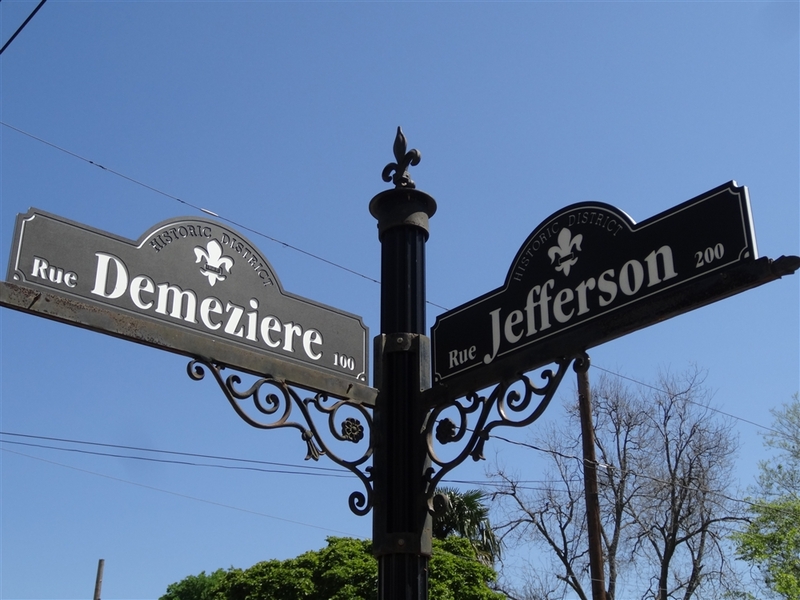 Natchitoches (pronounced somethNak-ki-tish) was established in 1714 (four years before New Orleans) which makes it the oldest permanent settlement in Louisiana. It was founded as a French outpost on the Red River but the river shifted since then (cutting the trade off) and what used to be the river is nowadays just a lake. 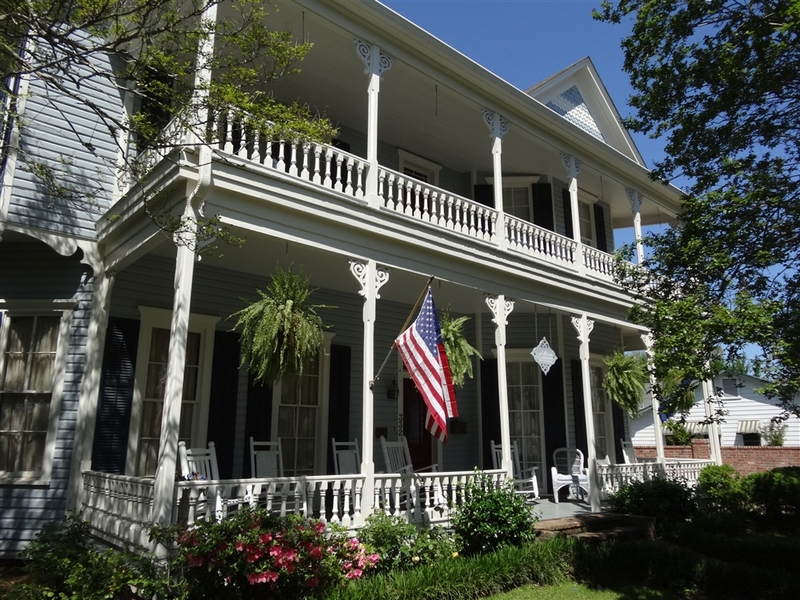 The town has a lively historic district with many B&B’s, restaurants, cafés and shops selling gifts, trinkets or even some genuine antiques. Lots of those businesses are lining the Front Street which is facing the lake (the one which once used to be the Red River). 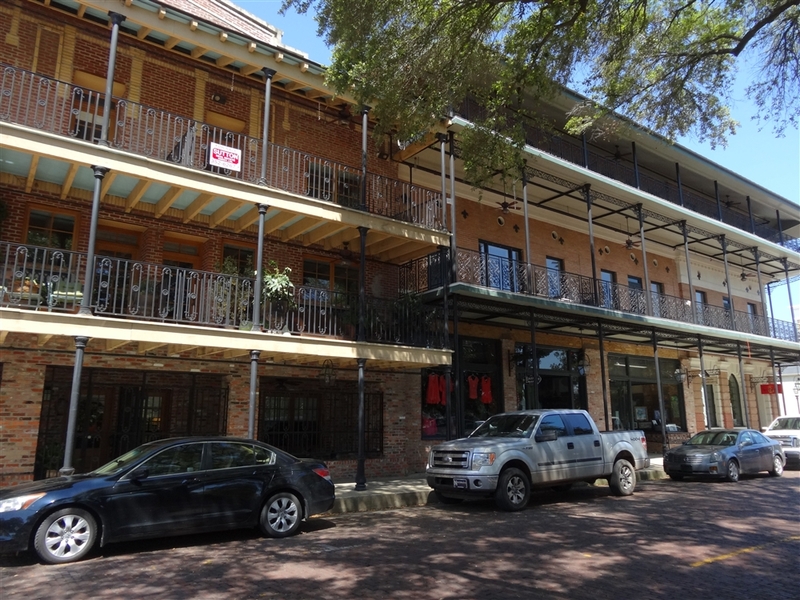 Many of them are located in buildings with wrought iron balconies which together with some French street names give the town an unmistakeably Louisiana feel. But it is not all just about the Front Street. The whole town is full of old historic buildings, oldest of them coming from 1780s when it was ruled by the Spanish. However, the main reason why we made it all the way here was the replica of Fort St. Jean Baptiste. The original fort was established in 1716 but it got abandoned by 1764 and its exact location is not precisely known. 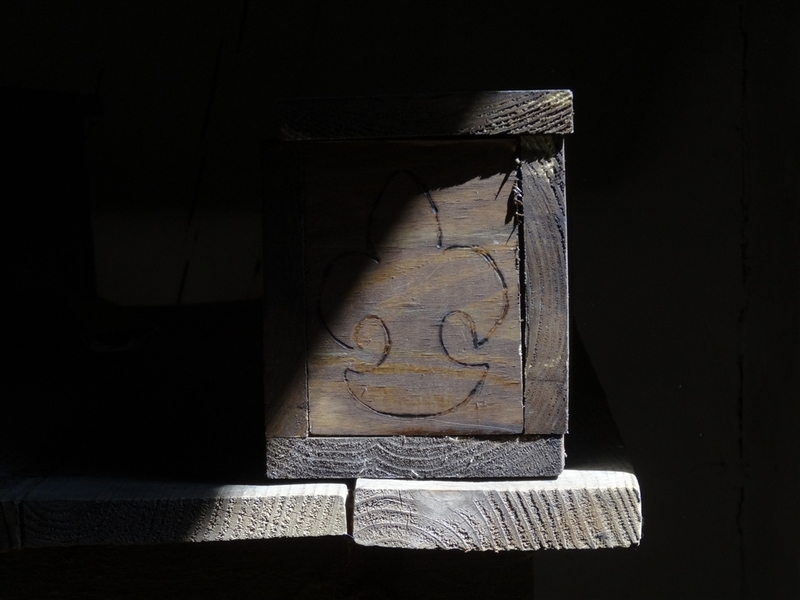 The current replica is based on the original footprints while the building materials were obtained locally. For example nearly 2,000 pine logs form the palisade and all of the hinges and latches were handmade at a nearby foundry. Many 18th-century techniques were also employed in the replication and the park does splendid job at showcasing life in 18 century French colonial fort. In many ways it resembles historic Fort Michilimackinac in northern Michigan (also built by the French in the 18 century) which I visited a few years ago. It just isn’t as big. Places like that really open one’s eyes to the fact how wast the area of French influence in North America was at the time. From Natchitoches we started heading south-east towards New Orleans which was still more than 250 miles away. However, instead of choosing the fast main highway we were navigating small roads which let us explore the, so called, Creole Country. One of them, Hwy 119, hugs Cane River Lake, a former channel of the Red River. There are numerous historic sites here which showcase unique creole way of life which was multicultural long before the word was even invented. Here French, Spanish and African influences were mixed with British and later American way of life. 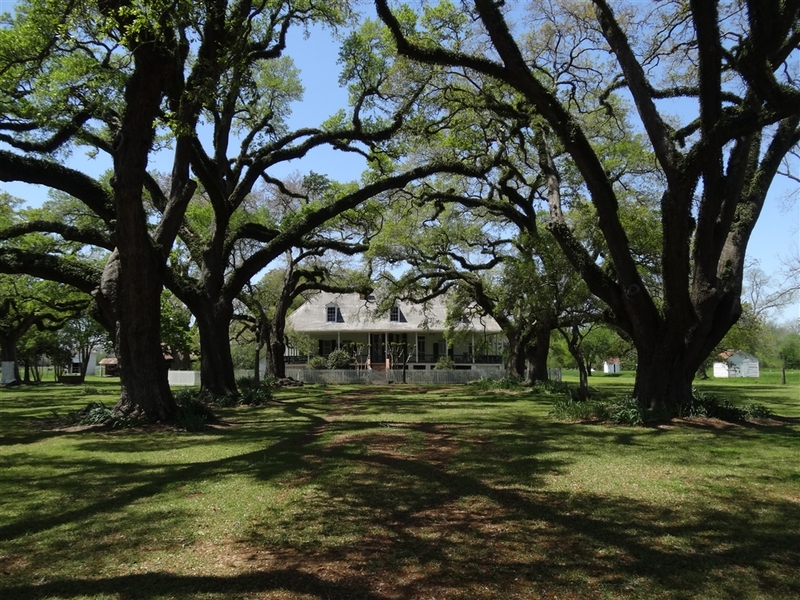 The region is managed as Cane River Creole National Historical Park and one of its best sites is Oakland Plantation run by the National park Service. 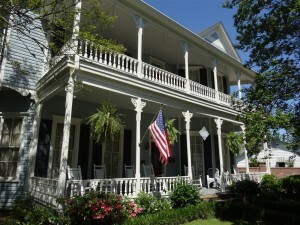 It was built in 1821 and it was one of the first plantations to grow cotton on a large scale. Now, there are many plantations open for visitors across the American South but most of them concentrate on presenting fine architecture of the grand mansions and lifestyles of the plantation owning classes. Slavery is usually just an afterthought, often clearly added only recently. Though Oakland also contains a fine example of a raised Creole plantation main house, more important here are the 27 historic outbuildings still standing on the property. 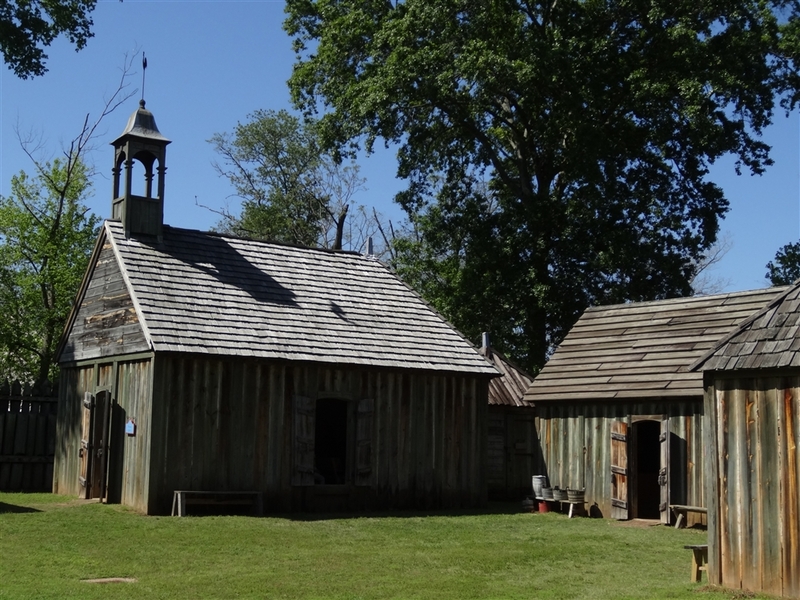 This rare wealth of buildings allows visitors to more completely understand life on a plantation as there are slave cabins and such unique features like two pigeonniers (buildings where pigeons were raised). I would strongly recommend joining a ranger-led tour of the mansion which offers fascinating insight into history of this place and the family which lived here until relatively recently. From the Creole Country we headed south-east again. This time we chose the main freeways (which let us gather some proper speed) and by the evening we arrived in Louisiana’s capital, Baton Rouge. We only had enough time to watch sunset while strolling around the state capitol grounds, more exploration had to wait for the next day. It was another glorious sunny morning when we parked our car outside the Louisiana State Capitol. Built in 1932 in the Art Deco style it is one of the most unique state legislatures as well as the tallest one. You see, it is a 34 story, 137 meters tall, skyscraper, still the tallest building in Baton Rouge, which is visible for miles around. Especially if you drive to the city along the interstate 10 from the west (as we did) you will see it sticking above the trees long before you notice any other sign of the city. The building does looks more like one of the NYC skyscrapers than a state capitol. We stated our visit from riding an elevator to the observation deck located on the 27th floor. 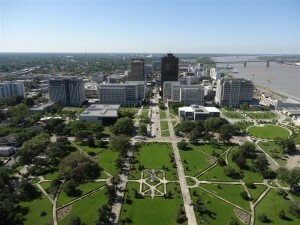 From there we admired panorama of Baton Rouge, Mississippi River and the surrounding areas. It is so flat in this part of Louisiana that nothing impaired our view all the way until distant (if a bit hazy) horizon. After getting back to the ground level we have spent quite a while admiring fantastically rich and symbolic details decorating the building inside and outside. One of the repeating motives was pelican which apart from being Louisiana’s state bird and symbol is also represented on the state flag and seal. There is so much interesting detail, I could write pages about this fascinating building but I’ll try to restrict myself. Inside the grand entry hall, so called Memorial Hall, are numerous statues and one of them depicts Jean Baptiste LeMoyne Sieur de Bienville, who founded New Orleans in 1718. The elevator doors are solid bronze and the walls surrounding the elevator are made of dark red Lavanto marble from Italy. The whole décor (like in many other state capitols or government buildings from that period) had a lot of similarity with the art of the socialist block. For example check out the murals. Quoting the state capitol guide: The mural on the east wall is referred to as the “Goddess of Knowledge and Time.” The central figure holds a zodiac in one hand and an hourglass in the other. Harvest scenes make up the background. 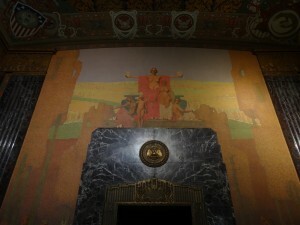 On the west wall, the mural is referred to as “Abundance of the Earth.” The central figure here represents agriculture and the figures surrounding her represent art, literature and music. Both murals depict Louisiana as a land of plenty” Doesn’t it sound like somewhere deep inside the Soviet Union? The Alabama limestone-clad exterior is no less impressive. Four allegorical representing Law, Science, Philosophy and Art are carved into the corners of the tower reaching from the 22nd to the 25th floor while four stone eagles act as flying buttresses from the top of the cupola to the beacon atop the tower. 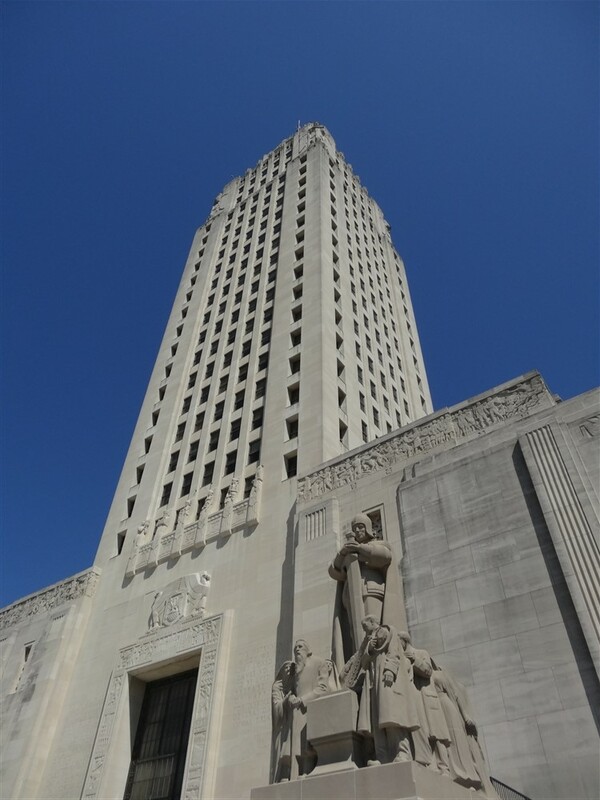 Closer to the ground, flanking the monumental 49 steps, are limestone sculptures entitled Pioneers and Patriots, respectively, memorialazing both the early settlers and defenders of Louisiana. Higher up a frieze runs along the top of the tower’s base, at the fifth floor, depicting the actions of Louisianans in wartime and peace, from colonization to World War I. All the mentioned decorations as well as many others are all great examples of Art Deco design, one of my favourite architectural styles (together with Gothic). From the current State Capitol grounds it is only a short walk to reach the Old Sate Capitol located on the bluff overlooking Mississippi River. Built in 1847 it is one of the best examples of Gothic Revival architecture in the United States. And it really looks like a medieval castle with all its turrets and cranellations. The most impressive feature inside is the spiral staircase and stained glass dome. Nowadays it houses Museum of Political History which focuses on rather dirty and corrupt politics of Louisiana. After the fine architecture of both capitols the rest of downtown was much less interesting so we decided to leave Baton Rouge and head towards our ultimate destination in the Pelican State, New Orleans. Obviously this splendid city deserves a completely separate chapter which I promise soon. This entry was posted in Uncategorized and tagged Baton Rouge, Cane River Creole National Historical Park, Creole Country, Fort St. Jean Baptiste, Louisiana, Louisiana State Capitol, Mississippi river, Natchitoches, Oakland Plantation on October 22, 2014 by admin.